What Would Judy Blume Do? A long time ago, in a galaxy that feels far, far away, I met Judy Blume. I went with a good friend (and fellow Judy Blume fan) to a Barnes and Noble in Boston for a signing—I think for the book Summer Sisters. I didn’t buy the book. Instead, I stood in a very long line with my beaten-up old copy of Are You There God? It’s Me, Margaret. This book meant a lot to me growing up. It felt like the only book I read as a kid that spoke—quite directly—to what I was feeling at the time. So, I blubbered shamelessly to Judy Blume about how much I love her work, and she very kindly signed my old book. I was thinking the other day about how gracious she was—and by all accounts, still is—and what an amazing group of books she’s written. In particular, I’ve thinking about her as I’ve been diving back into writing and hitting some snags. Tough times for characters always turn out to be tough times for me on a certain level. And as I pondered how to write about these difficult things, I wondered: When faced with hard topics, what would Judy Blume do? Treat the reader with respect. This is something Judy Blume positively excels at. Whether she’s writing chapter books, young adult novels, or books for grown-ups, she has an uncanny (and completely enviable) knack for knowing where her readers are at emotionally—and going there with them completely. This one is not easy to carry off (speaking from experience!). But if Judy Blume has taught me one thing—and let’s be serious: she’s really taught me a lot of things—it’s that there’s no beating around the bush. Sometimes your little brother kind of stinks. Sometimes your body isn’t perfect. Sometimes your parents make you move, or make other life-altering decisions over which you have no control. Sometimes things are great. Sometimes they’re positively awful. Know that there are no easy answers. Love doesn’t always last, even when you think it’s forever. God can feel really far away—and the path to finding him can be damned near impossible to make out. Part of being honest is admitting that life, in all of its complexities, is messy. Kids can not only handle this fact—I think they yearn to have it acknowledged. Just because the answers aren’t easy, doesn’t mean kids can’t take the truth. Despite this, keep your sense of humor. Okay, so your brother not only stinks, but he ate your pet turtle. And maybe, just maybe, chanting, “We must, we must, we must increase our bust” will somehow make those mammary glands grow. Or maybe not. But at least we can laugh as we give it a try. 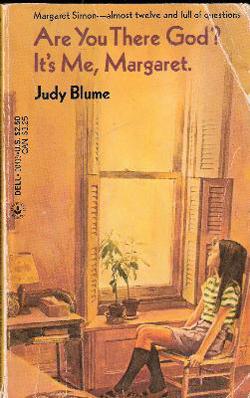 There are so many more lessons to glean from the books of Judy Blume, but these are the ones that I’m going to carry with me during these days and weeks when bad things will happen to perfectly good characters. And while I could never dream of writing with as much honesty and humor as Judy Blume, I can still ask: What would Judy Blume do? And I can be inspired by the answers.